Graal S.A. is a production and post-production facility in Greece. 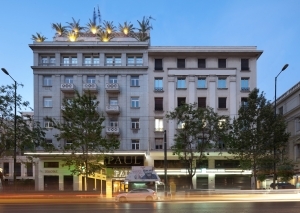 The company, currently in its 16th year of operation , is located in Athens. Graal is focused on cinema and its involvement in the cinematic process varies from the early stages of development to providing post-production services for short, feature films and documentaries. In 2006 it was assigned the digitization & Film restoration of 170 films from the FINOS FILM archives (1944-1975). The project took 3 years to complete and provided the company with unique expertise on handling and restoring archive material. Graal has produced three feature films and three documentaries to date awarded in international festivals. In 2003 entered international co-production for the first time and continued with a wide selection of projects, which expand beyond the Balkans. It has a wide international track record, with film in Cannes, Venice, Berlinale and other international festivals. The company has co-produced 47 films to date. It has a portfolio of approx. 370 titles. Since 2010 it is the main sponsor of the Agora Film Market section of Thessaloniki IFF, offering a complete image post-production award.